Many homeowners have are often wondering about what’s happening at home whenever they are out. Tom Coates, a San Francisco based British designer was able to answer this by giving his house its own Twitter account. 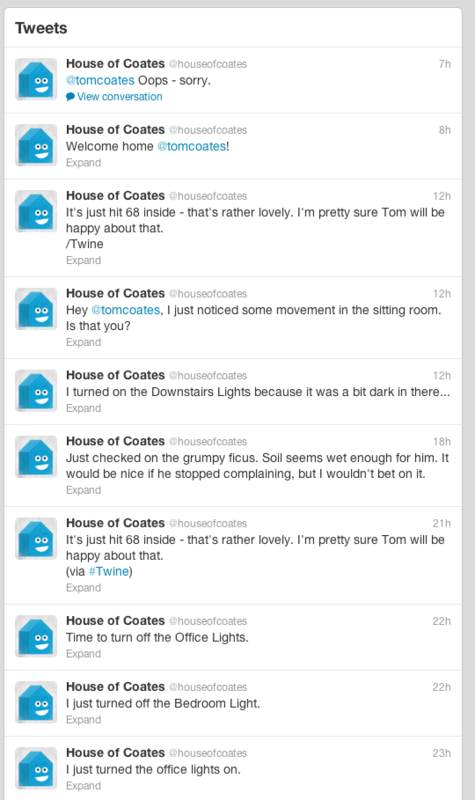 Coates’ house posts regularly on its Twitter account @houseofcoates. These tweets alert the owner of what’s happening at home, even when he’s away. The house tweets status updates about the weather, temperature, whether it turned the lights on or off. It even sends tweets to its owner regarding the state of the ficus plant that he has at home. How Can a House Tweet? You might think that it is too expensive to get your home “Twitter ready.” According to Tom Coates, equipping your abode with the tools need not be expensive. What he used were some inexpensive tools that he found in the hardware store to set up this system. He purchased light switches from Belkin WeMo that allowed him to turn his house lights on and off. Motion sensors from the same company are responsible for alerting him of any movements inside the property. A sensor box called Twine monitors the temperature of the house, as well as the moisture level of the soil of Coates’ ficus plant. This box also senses earthquakes as they happen through its vibration sensors. Lastly, he fitted his home with a video camera that allows him to see what’s happening inside his home using his smartphone. It sounds complicated, doesn’t it? He simplified the whole process by using a free web platform called IFTTT (If This Then That). The platform collates all the information gathered by sensors, then posts them on Twitter. People have tried to “talk” to the house numerous times. Mr. Coates admitted that when this happens he steps in to answer queries from the curious. House of Coates owner says that he doesn’t worry about intruders in his house. He said that it has enough sensors to tell him if there is someone inside who shouldn’t be there. He further stated that because of his camera, he would be able to see who broke into his home and report it to the police when necessary. Would you like your house to tweet publicly as well? Let us know in the comments!